Between 1826 and 1858 the state of Pennsylvania built and operated the largest and most technologically advanced system of canals and railroads in North America – almost one thousand miles of transport that stretched from Philadelphia to Pittsburgh and beyond. The construction of this ambitious transportation system was accompanied by great euphoria. It was widely believed that the revenue created from these canals and railroads would eliminate the need for all taxes on state citizens. Yet with the Panic of 1837, a financial crisis much like the boom and bust cycle that ended in 2008, a deep recession fell across the country. By 1858, Pennsylvania had sold all canals and railroads to private companies, often for pennies-on-the-dollar. 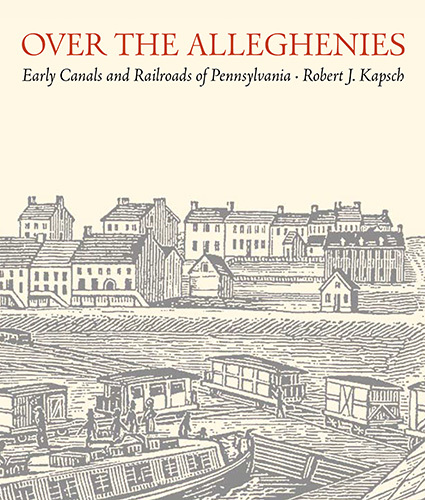 Over the Alleghenies: Early Canals and Railroads of Pennsylvania is the definitive history of the state of Pennsylvania’s incredible canal and railroad system. Although often condemned as a colossal failure, this construction effort remains an innovative, magnificent feat that ushered in modern transportation to Pennsylvania and the entire country. With extensive primary research, over one hundred illustrations, newspapers clippings, and charts and graphs, Over the Alleghenies examines and dissects the infrastructure project that bankrupted the wealthiest state in the Union. Robert J. Kapsch, PhD, Hon. AIA, ASCE, holds doctorates in American studies, engineering, and architecture, as well as master’s degrees in historic preservation and management. Kapsch spent fifteen years as the Chief of Historic American Buildings Survey/Historic American Engineering Record, the U.S. government’s premier documentation program, and has served as project engineer for numerous historic restoration and rehabilitation projects along the Chesapeake and Ohio Canal and other parks. Following this successful career as an historic architect and engineer for the National Park Service, Kapsch began a second career as an author, penning several books and articles on historic architecture and engineering, including The Potomac Canal: George Washington and the Waterway West, Historic Canals and Waterways of South Carolina, and CANALS, the Norton/Library of Congress Visual Sourcebook in Architecture, Design and Engineering. "Robert Kapsch’s achievement cannot be overestimated. He has succeeded where others have failed in creating one of the most imported manuscripts on early American Transportation systems. Over the Alleghenies is a monument to Kapsch’s wide knowledge of early American engineering and his study of the particular ways in which Pennsylvania applied and expanded both civil and mechanical engineering knowledge to create a functioning transportation system."